O God, who made Saint Margaret of Scotland wonderful in her outstanding charity towards the poor, grant that through her intercession and example we may reflect among all humanity the image of your divine goodness. Through our Lord Jesus Christ, your Son, who lives and reigns with you in the unity of the Holy Spirit, one God, for ever and ever. O God, who prepared a delightful dwelling for yourself in the heart of the Virgin Saint Gertrude, graciously bring light, through her intercession, to the darkness of our hearts, that we may joyfully experience you present and at work within us. Through our Lord Jesus Christ, your Son, who lives and reigns with you in the unity of the Holy Spirit, one God, for ever and ever. St. Margaret (c. 1045-1093) was the great-niece of St. Edward the Confessor. She was a Saxon princess, raised in Hungary in exile. Returning to England, she had to flee once again after the Battle of Hastings, to the court of Malcolm, the King of Scotland, whom she married shortly thereafter. She proved to be a model mother and exemplary queen who brought up her eight children in an atmosphere of great devotion and worked hard to improve the morality of her subjects. St. Gertrude, a Benedictine nun of the monastery of Helfta, in Saxony, is one of the great mystics of the Middle Ages. She was favored by visions of our Savior and has left a marvelous account of them in a book which she called Revelations. St. Gertrude introduced the devotion to the Sacred Heart which, four centuries later, St. Margaret Mary spread throughout the Church. She died at the beginning of the thirteenth century. According to the 1962 Missal of Bl. John XXIII the Extraordinary Form of the Roman Rite, June 10 is the feast day of St. Margaret of Scotland. She was born in Hungary (1046), where her father was living in exile, and likewise spent her childhood there as an unusually devout and pious girl. In the course of time she went to England, when her father was called to high office in his fatherland by his uncle, King St. Edward III. Fortune, however, soon reversed itself again (Margaret's father died suddenly in 1057), and upon leaving England a mighty storm — or better, divine Providence — brought her to the shores of Scotland. Upon instructions from her mother, Margaret married Malcolm III, king of Scotland, in 1069. The country was blessed by her holy life and by her deeds of charity for the next thirty years. Her eight children she zealously trained in the practice of Christian virtues. In the midst of royal splendor Margaret chastised her flesh by mortification and vigils and passed the greater part of the night in devout prayer. Her most remarkable virtue was love of neighbor, particularly love toward the poor. Her alms supported countless unfortunates; daily she provided food for three hundred and shared in the work of serving them personally, washing their feet and kissing their wounds. Queen Margaret of Scotland is the secondary patroness of Scotland. Margaret's copy of the Gospels is preserved in the Bodleian Library at Oxford University. Patron: Death of children; large families; learning; queens; Scotland; widows. Symbols: Black cross; sceptre and book; hospital. Often portrayed as: queen, often carrying a black cross, dispensing gifts to the poor. Read more about this wonderful wife and mother: Life of St. Margaret of Scotland, Catholic Encyclopedia entry, and David McRoberts' essay. Give special attention to the virtue of charity today by performing some service for the poor, i.e., send alms, buy baby things for a local crisis pregnancy center, take a food donation to a food pantry. Offer your support (even if it is just a little morale) to a mother with young children who is trying to raise her children to love God. If you are a mother with young children, pray to St. Margaret to help you imitate her zeal in training her children. If you are a mother and need a little boost, read Cardinal Mindszenty's book, The Mother. Today it might be fun to cook a pot of Scottish soup in honor of St. Margaret who probably cooked many pots of soup herself. For nameday celebrations of St. Margaret, a crown cake, denoting her rank would be appropriate; a book cake would recall the love she had for Sacred Scripture. Chocolate "coins" wrapped in gold foil could be distributed to guests in memory of her generosity. St. Gertrude the Great, a Cistercian nun, is one of the most lovable German saints from medieval times, and through her writings she will remain for all ages a guide to the interior life. She was born in 1256 at Eisleben and at the age of five taken to the convent at Rossdorf, where Gertrude of Hackeborn was abbess. Similarity in name has often occasioned confusion between the two Gertrudes. Our St. Gertrude never functioned as superior. In spite of much ill-health, Gertrude used her exceptional natural talents well, knew Latin fluently. When she was twenty-five years old (1281), Christ began to appear to her and to disclose to her the secrets of mystical union. Obeying a divine wish, she put into writing the favors of grace bestowed upon her. Her most important work, Legatus Divinae Pietatis, "The Herald of Divine Love," is distinguished for theological profundity, sublime poetry, and unusual clarity. How it stimulates love of God can be felt only by reading it; Abbot Blosius is said to have read it twelve times each year. St. Gertrude died in 1302, more consumed by the fire of God's love than by fever. Patron: Nuns; travellers; West Indies. Symbols: Crown; lily; taper; seven rings; heart with IHS; heart. Teach your children the Hail Mary in Latin. Read The Life and Revelations of St. Gertrude the Great. Pray the Novena of the Sacred Heart; say the Litany of St. Gertrude. Born in the Castle of Helfa, near Eisleben, Saxony, to one of the noblest families of Thuringia, St Mechtilde, at 7, entered the Benedictine Convent at Rodensdorf – where her elder sister, Gertrude Hackeborn was already a nun. Under the tutelage of Gertrude, Mechtilde made rapid strides in virtue and learning. On account of her humility, piety and zeal she was appointed, when still relatively young, to direct the novitiate and the choir and as such she became the first teacher of St Gertrude the Great when the latter was placed in her convent at the age of 15. 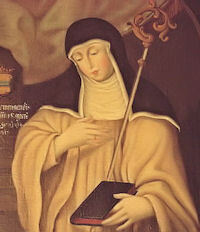 Though constantly subject to physical suffering, Mechtilde was ever intent upon joyfully singing the divine praises, and such is the key-note of the Book of Special Grace, in which St Gertrude and another sister-nun secretly (initially) set down the supernatural favors which God granted to Mechtilde. In his revelations Our Lord used to address her as his “Nightingale”, and he favored her with such spiritual insight and mystical experiences that learned Dominicans were sent to consult her on spiritual matters. Through these Friar Preachers Mechtilde’s book of revelations was widely distributed after her death. Incidentally, the book is structured on the ecclesiastical year; it is liturgical, Trinitarian and Christo-centric. It was, according to Boccaccio, very popular in Florence in Dante’s time under the title of the Lauds of Donna Matilda and devout Florentines used to recite divine praises from the book during devotions at family shrines. Together with St Gertrude the Great, St Mechtilde is one of the first to have stressed on devotion to the Sacred Heart of Jesus. “When you awake in the morning, let your first act be to salute my Heart and to offer me your own,” our Lord once urged Mechtilde. 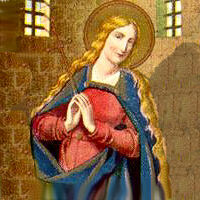 St Mechtilde breathed her last at the Helfta monastery on 19 November c.1298.